RaVon Bonner 6-yard TD run for Illinois. Score tied 7-7 with 6:05 left in first quarter. Illinois takes advantage of the turnover and finds the end zone. Tied 7-7 with 6:05 left in the 1st quarter. BOOM! 13th forced fumble for #Illini D. Most in FBS. Illinois forces a Rodney Smith fumble and recovers at #Gophers 15. Illinois ball at the Minnesota 15-yard line. Coughlin leads the #Gophers with 7.5 tackles for loss and 3.5 sacks this season. Santoso with a 52-yard boot and Illinois will start back up at their own 27-yard line. Redshirt freshman Drew Hmielewski in as punt returner for #Gophers . Last four TDs for #Gophers have been Demry Croft to Tyler Johnson hookups. The Croft-Johnson connection has hooked up for four TDs over the last two quarters played together. ???? First score to the Gophers. Croft to Johnson for 8-yard TD on opening drive. Gophers did most of work on ground. Huge running lanes for Smith and McCrary. Remember earlier this season when Coach Fleck said Kobe is like a monster truck tire? You saw why there. Smith is rolling early! Already has three carries for 30 yards (and one lost shoe). Smith takes the opening kickoff 26 yards and the #Gophers will start on their own 28-yard line. The #Gophers lost the coin toss and will receive to start the game. Minnesota first played Illinois in 1898 and lead the series 37-29-3. Walking out as today’s captains are Rhoda, Celestin and Carter. #Gophers TE Brandon Lingen (ankle) also out vs. Illinois. Have an ELITE first game and happy #UMNHC ! From the locker room via @IlliniLearfield : @LovieSmith shares his thoughts on Minnesota, injuries and today's opportunity for the #Illini . All of the #Gophers players who won't play today are injured. There are no suspensions, according to a team spokesman. For clarity sake, any Gophers player not playing today is injured. No suspensions. #Gophers guard Vincent Calhoun also not dressed for game. So that's three new starters or co-starters out: RB Shannon Brooks, CB Antonio Shenault and Calhoun. 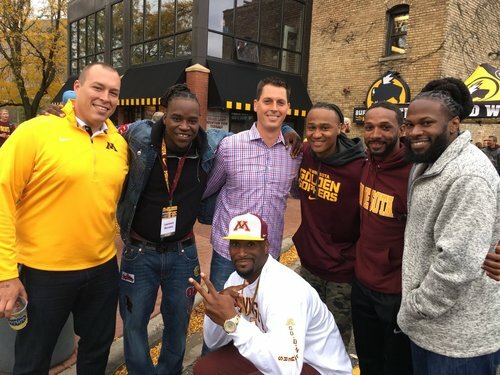 #Gophers starting cornerback Antonio Shenault and safety Antoine Winfield Jr. are not dressed for game, but cornerback Kiondre Thomas, injured in the Purdue game, is taking part in pregame warmups. Pre-game update from Randy Johnson: Good afternoon from a damp TCF Bank Stadium. Fans, your No. 1 question has been answered. The Gophers announced that sophomore Demry Croft will start at quarterback today against Illinois. 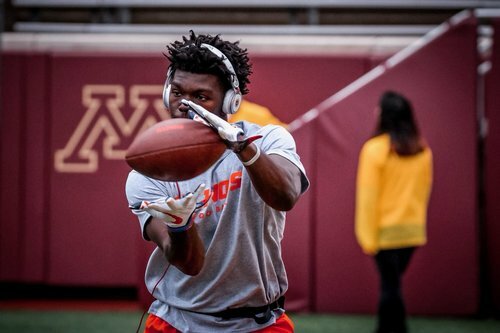 #Gophers running back Shannon Brooks isn't on the field with return specialists. He left last week's game against Michigan State because of a leg injury but later returned. Brooks has handled 15 of the Gophers' 16 kickoff returns this season. Rodney Smith has the other. 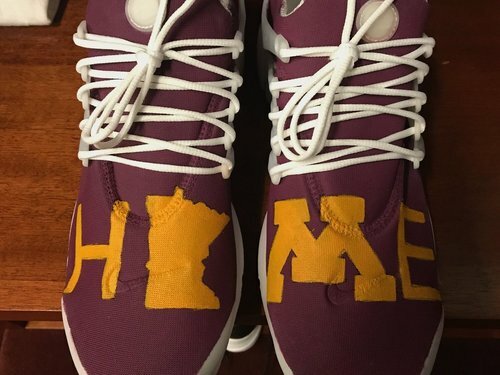 Elite Homecoming game day shoes for @Coach_Fleck ! ???? 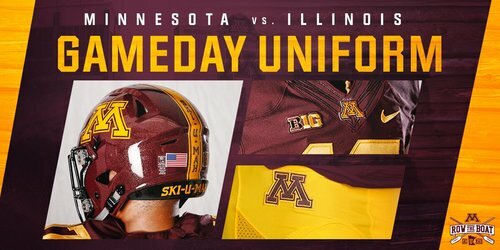 Today's #Gophers uniform combo: a proud tradition. 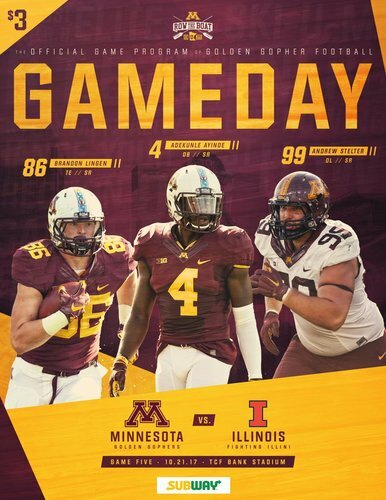 Uniform look for #Gophers today: maroon helmets, maroon jerseys, gold pants. Traditional look for homecoming. See the #Gophers arrive at TCF Bank Stadium for #UMNHC ! An 80-yard punt is remarkable. It's even more remarkable when it stops at the 2-yard line. Pick up a #Gophers game program on your way into the stadium! 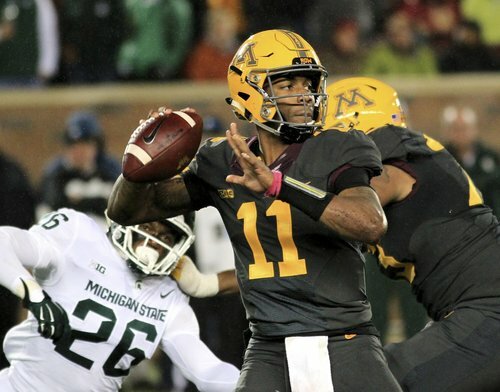 Croft led the #Gophers to three fourth-quarter touchdowns against Michigan State. He finished with 163 passing yards and three touchdowns.